Welcome to the web site for Ahn’s Tae Kwon Do (Ahn’s TKD). If you are in search of an authentic, hard-core martial arts school then you have found it in Ahn’s TKD. The main elements to consider when trying to determine if a martial arts school is “right” for you are the instructors, the overall instructional philosophy, and the style of martial arts offered. 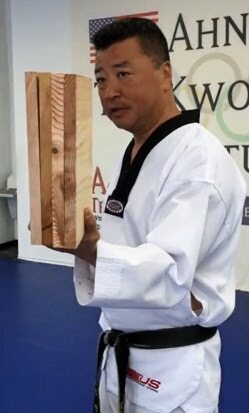 Master Chun Ahn breaks four self-held boards. Click here to watch video. Trained and received black belt rank in Seoul, Korea within Grandmaster Hwang Kee's school system. 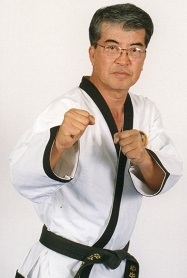 Grandmaster Hwang Kee was one of the primary founding fathers of Tae Kwon Do. In 1968 began teaching Tae Kwon Do in Texas, subsequently training thousands. Mission Leader of 1973 United States Tae Kwon Do team that took second place in the first International Tae Kwon Do Championship in Seoul, Korea. 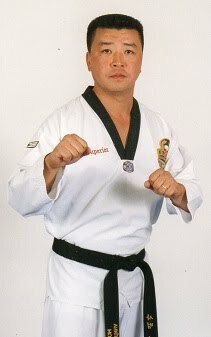 In recognition for his numerous accomplishments and contributions, inducted into the International Tae Kwon Do Hall of Fame. When he established Ahn’s Tae Kwon Do (Ahn's TKD), Grandmaster Ahn replicated the instructional style that he received in Seoul, Korea in the 1950s -1960's from one of the primary founding fathers of Tae Kwon Do (i.e. Grandmaster Hwang Kee). You cannot get any closer to the source than that without traveling back in time to 1950s - 1960's Seoul, Korea. If you enroll at Ahn’s TKD it will not be to simply study martial arts. It will be a commitment on your part to receive Tae Kwon Do training as it was originally designed and taught by Tae Kwon Do's founding fathers. On the Videos and Photos page you can watch a video of how Tae Kwon Do was practiced in Seoul, Korea in the 1960s. When you evaluate any martial arts school, a degree of skepticism is warranted. Far too many individuals illegitimately declare themselves as black belts, or even as grandmasters, in order to open up a martial arts school and attract students. Fortunately, these con artists are easy to spot if you know what to look for. Ask the main instructor where he/she received training and what international governing body granted him/her rank. All legitimate black belts display their rank certifications, granted by an official international governing body, in public view (usually prominently displayed in their studio). Using an Internet search engine you can not only determine what the international governing body is for a given martial arts style but you can also see what an official rank certificate looks like. In the case of Tae Kwon Do, Kukkiwon is the international governing that grants rank. A black belt cannot be obtained easily or quickly at Ahn’s Tae Kwon Do (Ahn’s TDK). You should pass on Ahn’s TKD if you are not prepared to work hard and to challenge yourself on multiple levels. Over the years, Ahn’s TKD has successfully trained a wide variety of individuals possessing varying levels of physical ability - some with limited mobility. With practice and dedication, virtually anyone can achieve a respectable degree of proficiency in the art of Tae Kwon Do. Students at Ahn's TKD are challenged on many levels such as aerobic conditioning, complex kicking techniques, sparring, and the development of the focus/technique necessary to smash through solid objects. Ahn’s TKD’s safety record is second to none. However, make no mistake about it, Ahn’s TKD provides instruction in one of the most lethal martial arts, not in dance. Over a multi-year journey towards black belt, there will be a few minor bumps and bruises along the way. This is unavoidable unless you select a school at which you can avoid all of the "blood, sweat, and tears" necessary to become a "bona fide" black belt. Easy martial arts schools, in which you can quickly obtain a black belt, are not hard to find. Ahn’s TKD is definitely NOT one of them. Ahn's Tae Kwon Do (Ahn's TKD) instructs adults separately from children. The same basic instruction is provided to both, however children receive a few extra instructional elements designed to instill and to reinforce structure, respect, and confidence. At certain times children's classes engage in games/activities designed to improve physical and mental skills; each of these activities have a direct martial arts application. The progress and developmental needs of every single child is constantly monitored. Ahn's TKD's safety record is second to none. The health, safety, and well-being of each and every child is the top priority of every instructor. All Ahn’s TKD studios contain a comfortable observation room from which parents are encouraged to view their children during class. Additionally, Ahn’s TKD instructors welcome and encourage a constant dialogue with parents regarding their children's progress and overall developmental needs, be these needs martial arts related or not. Ahn’s Tae Kwon Do (Ahn's TKD) has produced champions at both the state level (i.e. 32 Texas champions) and the national level (i.e. 17 USA champions) level. After more than a decade of heavy involvement in the tournament circuit, Ahn's TKD has chosen to reduce its emphasis on and its involvement in tournaments. The point has been proven - Ahn's TKD students can compete with anyone, at any level, and will win more often than not. Unfortunately, modern tournament sparring has simply digressed too far from what was originally intended by the founding fathers of Tae Kwon Do. If you were to observe a tournament sparring match today you would see two individuals bouncing up and down, in very close proximity to one another, attempting to be the first to "touch" the other with a foot. Points are awarded to ineffectual techniques and the combat strategy necessary to win a tournament sparring bout would be of very little help to you in a "real world" self-defense situation. Sparring at Ahn's TKD is consistent with the original intent of Tae Kwon Do's founding fathers. Ahn's TKD uses sparring to teach students how to effectively defend themselves in a "real world" self-defense situation. However, instruction in tournament style fighting is available to Ahn's TKD students who care to participate in tournaments. Martial arts schools can be found in virtually every city around the world. Across these martial arts schools you will find instruction in a wide variety of styles. The styles that most people associate with the phrase "martial arts" are the ones that originated in China, Japan and Korea. Generally speaking, martial arts styles can be grouped into two broad categories: hard styles and soft styles. Hard styles meet an attacker’s force with direct force; that is “head on.” Hard style techniques are predominately characterized by linear movements and brute force blocking/striking. Soft styles involve merging with and redirecting the force of an attacker so as to gain advantage. This merging and redirecting usually involves circular, non-linear movements that require a great deal of skill and precision to employ. With soft styles, success hinges on maintaining superb balance and using mechanical leverage/advantage to great effect. Individuals of smaller stature often find more success employing soft styles rather than hard styles. However, with sufficient practice any individual can gain skill in and successfully employ any given style. In reality, most martial arts styles incorporate a wide variety of techniques and are not 100% completely hard or soft. Ahn’s Tae Kwon Do provides instruction in Tae Kwon Do. Tae Know Do is a hard style martial art that originated in Korea in the 1940s. Read more about Tae Kwon Do.